KATHMANDU, March 8: Chief Minister Mohammad Lalbabu Raut has said he was totally against starting any confrontation with or maintaining a distance from the central government. 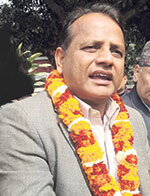 "The province cannot work without support from the center," the chief minister, who was in Kathmandu for a few days, told Republica on Wednesday. The chief minister said he was quite excited by the readiness shown by Prime Minister KP Sharma Oli to support him during the meeting between the two at the prime minister's official residence on Tuesday. During the meeting Raut put forward four issues before the prime minister. "First, I told him that his attention should be on Province 2 more than in any other province because it holds special significance in view of geopolitical, economical and social perspectives," he said. "Similarly, the security sensitivity of the province is equally important." He requested the prime minister to create an environment where he can effectively mobilize the chief district officers and superintendents of police in the province. Raut said he was quite impressed by Oli's readiness to support him who suggested him not to hesitate to contact him if any problem arises. "I briefed the prime minister on my plans and priorities for the province. He said he would extend me full support," said Raut. Raut said transparency in governance will be his top priority. "Under no circumstances will I allow misuse of development funds," he said. "I know very well that development works can't be expedited in the province without first stopping corruption and irregularities from the central to the local level." He said his five priority areas are good governance, education, health, roads and irrigation.